Diagnostics and Exam Findings: Foal was found with a deep laceration on the medial aspect of the forearm of the right front leg approximately 300 cm² on August 9, 2018. 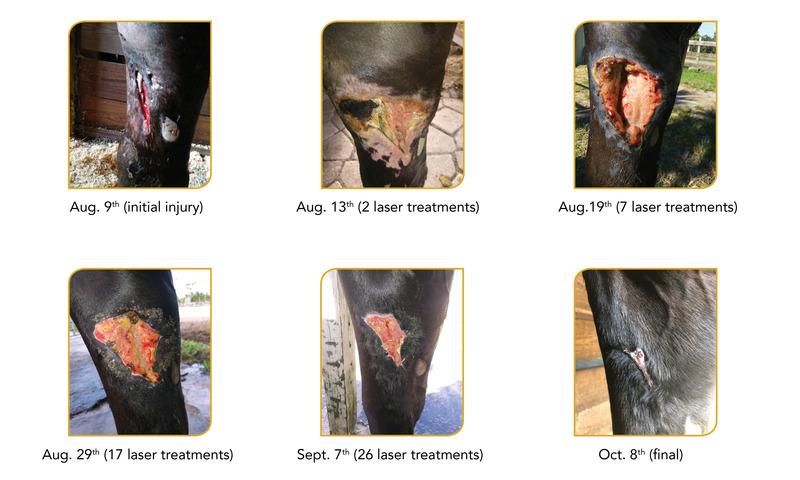 Laser Treatment: Wound was treated with the large off-contact treatment head with a dosage of 9 J/cm² totaling 2,730 joules administered at 6.5 watts of power. The entire affected area & nearby healthy tissue margins were treated. Frequency of Treatment: Laser treatment was delivered starting August 10th , then again on the 11th , then started daily on the 14th and continued through September 25th , for a total of 44 treatments. Other Treatments: 4 grams of Phenylbutazone was given for first 4 days, then 2 grams daily for 3 days; 20cc of penicillin for first 10 days; topical spray “Creollina” solution for first 14 days; wound kept wrapped for first 10 days; after wound was left open the wound was cleaned with betadine solution and treated with “Equine Magic Salve” twice daily for first 30-days then backed down to once a day until wound was almost closed. Comments: This type of wound would normally take a minimum of 90-days to heal and this wound was completely closed up on October 8th, 60-days from injury. Laser speeds up sloughing of the skin at the beginning of treatment to allow for faster healing. Sloughing was expected to take 7-10 days and occurred 4 days after injury on August 13th.